In laboratory circumstances there are sometimes liquids (or solids!) that need to be transported and, to be frank, using a beaker or flask is a poor option. I am talking about liquids like Liquid Nitrogen (−196 °C) , Liquid Oxygen (−182.96 °C), Liquid Argon (−185.84 °C) or Dry Ice (solid CO2 @ −78.5 °C). Putting these liquids into standard glassware is going to a) let them evaporate in a very short period of time and b) possibly damage the container. So what can you do about getting that LN2 from the pressurized container to the experimental station? You need very big thermos, or to use the proper term: a Dewar! Dewars work by using insulation to prevent external temperatures from reaching the cooled liquid. Inside any Dewar are two layers of glass, one outside layer and one inside layer. Between the two layers the air has been removed so that only a vacuum remains. Since a vacuum has not matter to heat/cool the temperature exchange between the outside and the inside is minimized. In addition to this, other features of a Dewar may be employed to reduce evaporation of the liquids: Silvering the glass reduces any reflection of light that can add heat to the system. Narrow mouths are also used on some designs that are just used for transportation to minimize the heat exchange from above the Dewar. Spectrum has recently added two lines of Dewars from SciLogex. These Dewars are open top models (so that they are usable for more than just transporting and pouring). The first line features a blue metal casings and range in size from 1L to 10L. They have vented lids, employ silvered borosilicate glass, and have wide mouths for insertion. The also have carry handles and the lids have their own handle. The blue metal casing is corrosion resistant (important given the possibility of condensation forming on the flasks. The second line is similar in features but uses a stainless steel casing. This model is better suited for environments where hygene is an issue as the stainless steel casing is easier to sanitize and keep clean. The stainless models range in capacity from 1L to 7L and feature the vented lids, handles, silvered borosilicate glass and wide mouth tops. Both designs can hold Liquid N2 from 38 to 70 hours, depending on the size of the Dewar. SciLogex Dewars are excellent for any company needing a way to transport or temporarily store LN2 or Dry Ice. Want to buy Dewars at Spectrum Scientifics? Metal Earth – Star Wars. They. Are. Here! We’ve been waiting to get these for a while. A lot of little delays happened with production and ordering but now we can happily say that we now have METAL EARTH STAR WARS MODELS! Spectrum Scientifics has been an excellent source of rocks, minerals and fossils since we first opened. We always love adding new items to our geology offerings. Recently we added a few new items that are fun, attractive, and come in their own little gift box! This model consists of a cut-away 3D model of the interior of the heart as well as a model line of the human body’s veins and arteries. The model is tactile so students can trace the path of blood through the heart or the entire body.In addition a colorful three-overlay transparency of the heart is provided for further details. With this set student can get a clear view of how they breath. The 3D cutaway features three detailed reliefs. the cutaway human torso , and enlarged Bornchial tree and greatly magnified alveoli. The torso shjows multiple layers of the lungs as well as detail of the nasal passages, etc. Supplemental materials are included as well. This models shows details of the mouth, salivary glands, esophagus, stomach, liver, pancreas and intestines. Each section has a cutaway and enlargements are made of the stomach and intestines. Transparencies and other supplemntary teaching materials are included. This model demonstrations the structure of our central an peripheral nervous system. The cutaway human brain includes a removable transparent overlay defining the lobes. Details of the spinal cord, spinal nerves dendrites, axons, and synapes are included. This model features colorful views of the kidneys in detail, illustrating a magnified nephron. The kidney portion is dissected to illustrate the cortex, pyramid, calyx and papilla. This activity set helps students understand the structure and function of the endocrine system. Seven endocrine glands are depicted in whole and magnified sectional detail along with several related organs. included on the mode are the pituitary, thyroid, parathyroid, adrenal glands, pancrea, ovaries, and testes. Each set of models sells for $139.95 as of this writing. Teachers can also order Human Body Systems Master Set which includes all six models and their supplemental materials. Interested in other educational human organ models? New from BenchMark Scientific – The Vornado! Vortex mixers are an important part of any lab that needs to mix or stir liquids thoroughly. The vortexing action (video link) assures an even blending and since you just push the tube or beaker against the Vortexer you don’t need to waste any time loading a shaker. The Vornado measures less than 4″ wide and mixes with a fixed speed of 2800 rpm on a 4mm orbit. It can handle tubes up to 50ml in capacity. The overall size is under 4″ x 4″ making it perfect for crowded labs. And yes, that does mean it can literally fit in the palm of some people’s hands. Labware? Is that a topic you can have a ‘Fun Fact list about? Well, let’s find out! 1) Most glass Labware is made from Borosilicate Glass. It is used because it has low thermal expansion properties. What this means is when you heat up the glass it won’t expand and thus shatter like regular glass would. A brand name for Borosilicate glass that most people are familiar with is Pyrex, which is used in many kitchenware products that needs to put up with the heat. 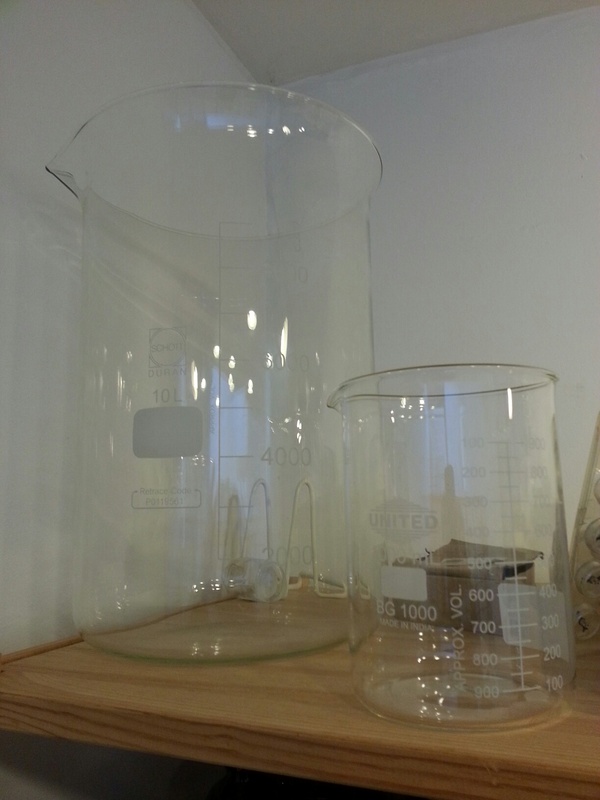 2) A beaker has straight sides, a flask can have angled or even curved sides. 3) While most labware is made of glass, a not insignificant quantity is made of plastic. This is handy for experiments where no heating is needed and the threat from dropping glass labware is a real danger. 4) The vast majority of glassware is considered ‘Class B’ glassware. Which is good for most measurements. ‘Class A’ labware is much more expensive and is much more accurately calibrated for measuring. It isn’t necessarily better made. 5) Yes, Virginia, there really are 10L Griffin Beakers! 6) Griffin Beakers are named after 19th Century Jon Joseph Griffin, Erlenmeyer Flasks are named after 19th-20th century German chemist Emil Erlenmeyer. They are among the very few types of labware named after people. Most other labware is more descriptive of its shape or task: Measuring Cylinder, Round-Bottom Flask, Pipettor, etc. 7) What should type of labware should you use? Depends on what you are doing. Simple reactions should use a Griffin beaker, shaking something up? Use an Erlenmeyer Flaks. Need precise even heating of a mixture? Use a Round Bottom Flask (and support), filtering something? its easier to filter to a smaller mouthed flask than a beaker, etc, etc. 8) Far and away the most popular labware are simple Test Tubes. They are used for a variety of purposes such as mixing, heating, etc. Test tubes have to do these things on a small scale, however. 9) Many reactions done in flasks need a stopper of some kind to keep the liquids in the flask. Be careful when buying a stopper however as most measurements are done for rubber stoppers. Cork stoppers use an entirely different scale! 10) Cleaning labware is one of the most critically underrated needs of a laboratory. Most flasks won’t get clean in a dishwasher, for example as they have such small mouths the water won’t get in, pipette tubes are too small and long for the water to get in, etc. Washing by hand is usually what is required in most cases. To help out labware producers and sellers often have an entire line of specialty bottle brushes to help with the cleaning. Pass the soap! Want to buy labware or other Lab Equipment?